Photography Copyright © Guy Tal. All Rights Reserved. What drove you into Nature photography and Landscape photography in particular ? I have to admit it may have been more of a lucky coincidence than anything else. From a young age, I always loved being outdoors and exploring the fields around my house. At one point I decided to borrow my dad’s camera and tried to photograph some of the things that fascinated me. I wasn’t very successful but the experience stayed with me and a few years later I bought my first “serious” camera and started photographing in earnest. In the early years I wasn’t too concerned with subjects, light, or composition. I photographed anything I found even remotely interesting just for the joy of it. I didn’t have too much to compare myself against and really didn’t consider it any more than a way to document my findings and share the more interesting ones with friends. When I moved to the US in my late 20s, a lot of things changed. I devoted more time to my IT career and nearly stopped photographing completely for a couple of years. It took me a while to realize I felt lost without having wild places to get away to. I was living alone in a new country and had little idea what was out there. I turned to books and was introduced to the works of American nature photographers and to the amazing natural beauty of the American West. It felt like I finally knew what I was meant to do. I started hiking and exploring with a passion that only grew and intensified the more I saw and the more I learned. The places I visited transformed and enriched my life and I knew I had to do whatever it took to make my home here. All Guy Tal images have a unique style, how do you define your style and how has it ? I like to believe that each and every one of us has a unique style. The real hurdle is letting go of the expectations of other people and being able to peel away all the things that keep your own voice from coming through in your work. I donʼt really try to impose a style on my images. Instead, I try to not think of what other people might do or like and focus on the things that attract and stand out to me. Working in this way, my style evolved with me. Every person is the sum of their knowledge, experiences and beliefs, and, as these grow, you may find yourself interested in new things or better able to appreciate things you already know. Add to that the evolution of skills and technology and you will find endless room to grow and explore. I think those who arbitrarily choose to restrict their creative options just to maintain a consistent style are robbing themselves of the pleasures of true creative expression. Be yourself and your style will follow. What is your source of inspiration for photography? Everything. Life, experiences, relationships, knowledge, art, you name it! Anything I come into contact with changes me a little and makes me better able to appreciate and understand the world and myself. Some things are more powerful than others, though. To me, the most inspiring state of mind is being out in the wild, as far away from the human-made world as I can get. Itʼs a feeling that is hard to describe to anyone who had not experienced it. Waking up to a silent morning in a pristine place and without the constant nervous buzz of machines and vehicles and crowds is a very profound feeling and, once you know it, is impossible to live without. What is your favorite subject in landscape photography ? Iʼm not sure you could call it a subject but what I try to teach my students is to photograph the experience. The actual objects that make up the image, whether trees, sand dunes, rivers, oceans or anything else, are all part of an experience. The more moving and meaningful the experience is to you, the more meaningful your images will be, regardless of whatʼs actually in the frame. Something of your state of mind is expressed in the lines, colors, and patterns that make up the image. What are the top 3 places you love to shoot landscapes ? Any dream locations which is yet to be explored? My home is a large desert region known as the Colorado Plateau. 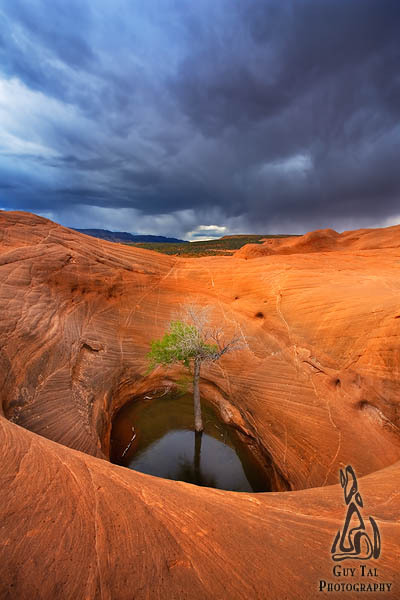 Most of it is located in the state of Utah in the Western United States. It is not only my home but also my favorite place to explore, study, and photograph. My two runners-up will likely be the northern parts of the American continent, including Alaska and northern Canada, and the mountain ranges of the Western US; particularly the Rocky Mountains and the Sierra Nevada. Of the places I havenʼt been to yet, I am most fascinated by the Himalayas and the Tibetan Plateau in Asia, the Altiplano and the Andes in South America. I hope to find my way there in the next few years. Landscape photography involves getting up early in morning and staying back late in evening or camping in remote locations to get that dream image. In such circumstances how does your family respond/encourage/support you? While it is true that the “golden hours” yield beautiful images, I enjoy working inevery type of light so I actually donʼt limit myself to early mornings or late evenings. I do, however, spend a lot of time outdoors and away from home. I am fortunate to have a wonderful and understanding wife who supports my work and understands my need to be away in remote places every so often. Being away does take a toll but it also makes the times we are together more meaningful. ‘ It’s important to know the rule, but it’s equally important to know when to break it ’. According to you, how much is this true in the case of Landscape photography? Itʼs very true. In fact, I think itʼs more of a chicken-and-egg situation. More often than not, I just photograph what feels right only to realize after the fact that it happens to conform to some visual rule or another. When working on a composition, I am aware of the rules but I donʼt explicitly think in terms of applying or breaking them. I let intuition drive my creative decisions. Sometime my images end up within the rules and sometimes they donʼt. The only real rule you should adhere to is the one in your gut telling you whether the composition works, or not. There are two types of photographers – one who spend time off the field and think about concept and pre­‐visualize before getting into the field and work on realizing what they had thought and pre­‐visualized. Then there are another type of photographers who think on the field and take decisions in real-­‐time to get some unique perspectives. Which type do you belong to? I think I may be both, at different times. I almost always go out without a preconceived idea of the images I will come back with but, on some occasions, Iʼll identify a concept I want to develop and may decide to make repeated trips to realize it. I still try to consciously keep an open mind for new concepts, even when I already know what Iʼm after. Thereʼs always room for new interpretations and ideas. With close to 2 decades of photographic experiences, tell us some of the best surprises that you have had when you are out there on field? Itʼs actually been more than 2 decades, which is scary to think about. Perhaps the most surprising things for me were the friendships and relationships I made along the way. Iʼve never been a very social person but thereʼs something about making a connection with people who share the same passions that I find very powerful. I was also fortunate to have interesting encounters with wildlife on some of my trips. I can vividly remember seeing my first grizzly bear in the wild and the mix of fear and fascination (for both of us, I imagine) that made it an amazing experience. Iʼve had similar moments with a mountain lion (cougar), coyotes, and any number of other interesting beings. I also remember summiting my first “real” mountain and the thrill of standing, alone and exhausted, high above the scenery. You always imagine what these moments will be like but youʼre never really prepared for the way they change you and become part of who you are. How much of influence does digital era and also invent of tools like Photoshop had on your photography? Thereʼs no doubt that technology makes a lot of things possible and consistently opens up new possibilities and better. Iʼm grateful every day to have these tools available to me to help express and refine my vision and improve the quality of my work. At the end of the day, though, they are just different ways of doing the same thing: creative expression. Ancient people painted with pigments on cave walls, we have computers and printers, but the reason and need to do what we do is exactly the same. Can you walk us through one of your favorite images which is close to your heart and the story behind it? It was a warm and stormy night . . . It started like any other summer Friday in Torrey. Right around 5pm a peaceful silence falls over the town and the work week is almost palpably over. Despite the sparse traffic, on days like this I like to stay at the gallery a bit further into the evening, not so much for the sales potential but because these are often the times when lone travelers wander into town in search of a place to spend the night. When it’s just me and one curious visitor in the store and all is quiet and glowing in the late afternoon light, conversations tend to form and evolve in fascinating patterns. After closing the shop I headed home, remembering the local music show scheduled for the evening and fighting the urge to spend a quiet evening on my own. I knew most of the people playing though I have not actually seen some of them perform. I decided to go. What the hell, I was already dressed. 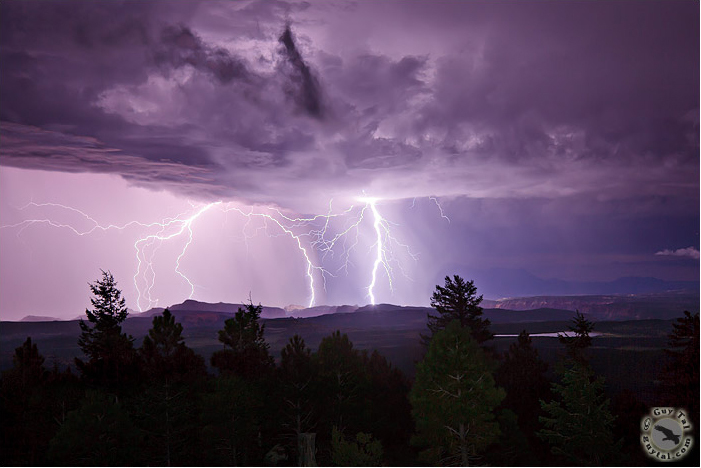 A monsoon thunderstorm started brewing earlier in the day and seemed to linger more than usual with the occasional flash of lightning over the Aquarius Plateau followed by a distant rumble. It was a perfect warm afternoon bathed in golden light as the sun was lazily sinking little by little in the summer sky. The musicians tuned their instruments against a backdrop of majestic cliffs, green groves of aspen and conifers on the distant flanks of Boulder Mountain and the unfolding storm beyond. All was bright and vivid in the warm light. On the large lawn, a small crowd of familiar faces engaged in friendly chat. Life here is not easy for many but right here, right now, there was an overpowering air of joy and contentment as if the moment is all that mattered and all else can wait for another time – a state of mind I have come to greatly appreciate about this place. As soon as the first guitar notes launched off the stage into the warm stillness of a perfect summer evening, I knew the reason I was here. One by one people I knew, some for years, transformed before my eyes. They were no longer farmers, cowboys, builders, teachers, or retirees; they were giants. For those few moments on stage they poured their hearts into their instruments and microphones, consumed by their passion, love, and angst, and consuming everyone else within earshot right along. It was a glimpse into the blazing turbulent core of their humanity, independent of anything else they happen to do in their daily lives. You never know the depths of soul some people harbor, even ones close to you, until you get the chance to see them in their element, telling their stories, greater than life. The storm kept firing bolts of lightning in the background throughout the evening but spared us the precipitation until the very last moments of the show. By 11pm only a handful of people remained to hear the last notes fade and help clean up the stage as the first drops of rain finally hit. I walked back home along the avenue of old cottonwoods in the quiet drizzle. I knew I was too saturated to get any sleep. I still tried. The lightning was closer now, illuminating the room every few seconds. Sleep was a lost cause. I had to go experience the magic up close. I quickly got dressed and headed up the dark road to Boulder Mountain. A movement caught my eye just beyond the reach of the headlights and I slowed down in time to avoid a skunk dragging something off the pavement. Another half mile and a strange jumble of iridescent dots turned out to be the reflections from the eyes of four raccoon cubs playing in the brush by the side of the road. A large owl floated silently from the top of a nearby aspen. The world was alive in a way most people never know. It was around 1am when I finally arrived at a high viewpoint. I stood there in total darkness for a few minutes, breathing the scent of the recent rain and thinking about the music and the amazing people behind it. Though I could only see it in the brief flashes of lightning, the canyon country stretched far below me: Capitol Reef, the Waterpocket Fold, the Circle Cliffs, the Blue Hills, and beyond them the commanding peaks of the Henry Mountains. I set up the camera in the dark, opened the shutter and waited. Within fifteen minutes or so, I was able to record three impressive strikes. I kept driving, hoping to find another good view but the storm was already fading. I turned around and headed home. 3am found me in my living room, sipping tequila and listening to the quiet snoring of my dogs, knowing that one day in the future I will come back to the memory of this night and want to remember it in every last vivid detail. 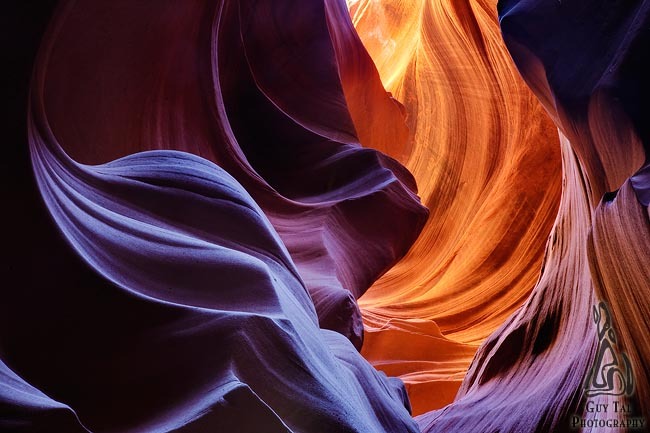 What’s the idea behind Guy Tal Gallery? Like many photographers, I always wanted my own gallery where I could display and sell my work. Beyond that, though, I wanted a place where I could sell my images the way I wanted to. I donʼt really believe in edition limits, which are required by some galleries. I also didnʼt want to conform to a specific look, like the traditional white mat and black frame. Having my own gallery allows me to have complete control over the presentation, pricing, editions etc. Itʼs also a great place to meet people and learn about how they perceive my work. 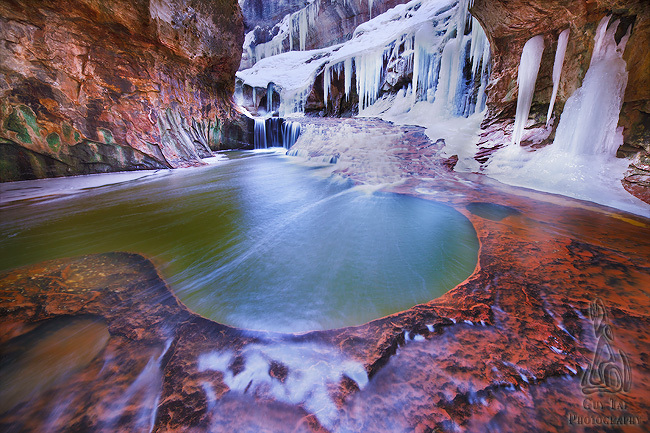 What is the motive behind coming up with the e-­book “Creative Landscape Photography”? What’s your experience of this transition from a Blogger to an Author of a book? I donʼt really see it as a transition. They are two different outlets for sharing my thoughts. Writing the blog helps me think about things and elaborate on ideas until I feel they are ready for a more elaborate format. I enjoyed writing since I was a teenager, even before I picked up a camera so it feels natural to me to express myself in words as well as images. The main motive behind the eBook was to offer something I never found in books myself – a photography book dedicated to the thoughts and ideas behind making images. In a way it is a book I wish I could give myself 20 years ago. It is also the first in a series Iʼm planning and Iʼm currently working on the next title which will be a little more technical in nature and discuss creative image processing. What sort of groundwork do you do before going out for any shoot? What’s in the bag ? On a typical Landscape photography outing. Today itʼs primarily a Canon 5D Mark II, 17-40 zoom, 24-105 zoom, and 70-200 zoom. If Iʼm backpacking I may leave the 24-105 behind and if itʼs expected to be a very difficult hike I may only take the 24-105. I have an assortment of other lenses that I use less frequently and usually only when working near my vehicle. I use a sturdy Gitzo tripod on most hikes but if weight is an issue, I also have an ultralight Velbon tripod thatʼs easier to carry. The only filter I use is a polarizer although recently I also started experimenting with a 10-stop neutral density filter. Everything goes into an F-Stop Tilopa backpack. Iʼm eagerly awaiting the more rugged model (the Tilopa BC) which should be here next week. Tell us the story behind the new “Guy Tal Photography” logo? I mentioned before that my favorite place is the Colorado Plateau. 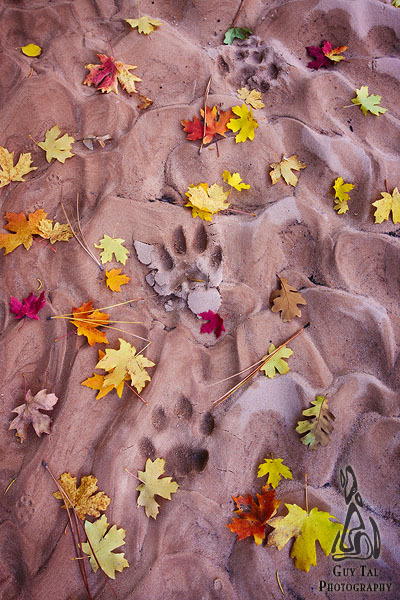 Perhaps the two animals most readily associated with this area are the raven and the coyote. For a few years, I had a raven on my logo, though I also had the design for a coyote graphic. After my dog died recently I decided to do something in his memory and asked a graphic designer I know to use my original coyote graphic and make it look like something between a dog and a coyote. The new logo is the result. Finally,3 most important pieces of advice you would like to give budding Landscape photographers? Don’t obsess too much about gear. Get a decent camera, lenses, and a tripod that fit your budget and then start working on your creative skills, understanding composition and light. Becoming skilled in processing your images is every bit as important to the end result as capturing them in the field. Don’t be a follower and don’t be afraid to challenge conventional “rules” and pursue your own instincts. 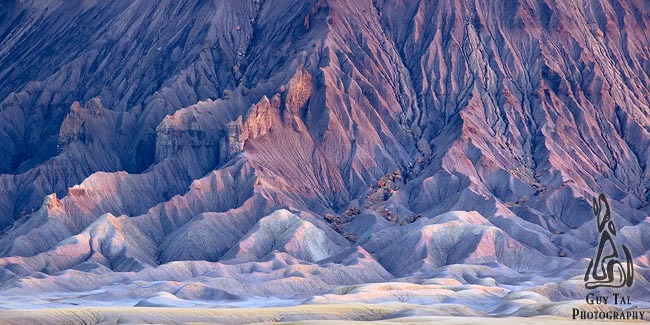 Guy Tal is a naturalist, photographer and writer residing in the state of Utah, in the heart of a unique and scenic desert region known as the Colorado Plateau. 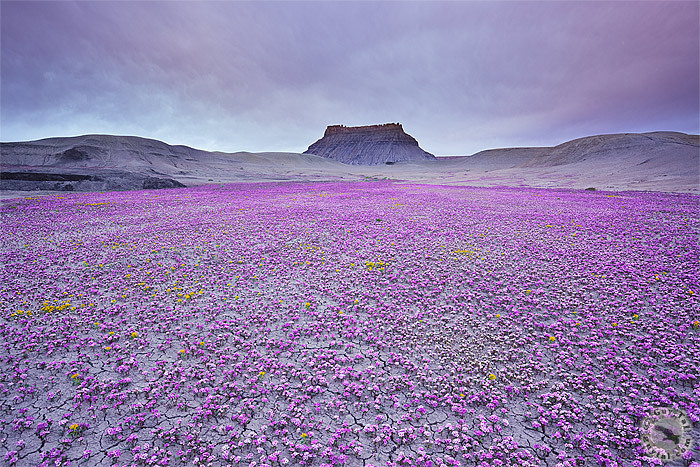 Guy Tal’s goal as a person and, by extension, as an artist, is to witness, participate in, and hopefully share the delicate beauty of wilderness – those moments in time when nature and spirit transcend the manufactured reality of politics, wars, fashions, and mass media, to inspire the raw emotion and primal awe that lies dormant in each of us. 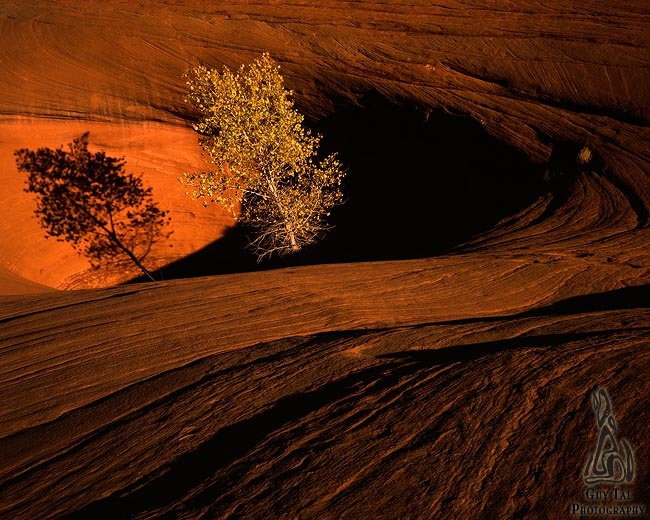 Guy Tal is a fantastic writer and his evocative writings can be found on his blog. 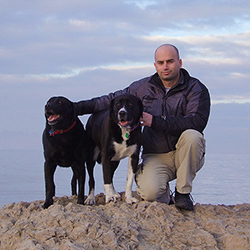 We sincerely thank Guy Tal for being very kind in answering our questions. Really appreciate his time and thoughts. This is truly inspirational! Highly insightful thoughts accompanied by sensational images and rounded off by a heart-rending story beautifully written make this an interview to cherish and remember! Many thanks to the Landscape Wizards Team for bringing this to us and all the very best to Guy to continue producing sublime images crafted with his extraordinary vision and passion! Wow!!! this is truly inspiring and thought provoking!!! An interview with Guy, whose writing has inspired me a lot – what more should I expect from the LW team!!! Guy’s image quality is only equaled by his photographic and environmental ethics. Thanks for the insightful and educational post about Guy and is fantastic work. Thanks for a really informative and educating interview. The questions are apt and the answers have triggered several strings of thought in my mind..